While marketers understand the power of referral, many are stumped when it comes to using it effectively. Most people think that referral programs are a matter of economics and incentives—get it right, and you’ll keep the referrals coming in through the front door, and maximize loyalty and retention. But what’s surprising is that the most successful referral programs look beyond the numbers—they leverage design to make referral programs that people actually use. It’s through design that you can trigger consumer psychology in a way that truly unleashes the power of referral. After all, what makes referral so powerful in the first place is that they draw upon the power of organic word of mouth—they come from one human, to another. Let’s walk through the 5 basic principles of psychology that power referral, and how you can harness them to get your Refer-a-Friend program into gear. Hear it now, see it now, buy it now. When it comes to your referral program, instant gratification is key. It’s all about reducing friction. In order to maximize impact, your referral program needs to be seamlessly integrated into the customer journey. Psychology tells us that we prefer smaller, immediate rewards to larger but delayed rewards. The longer a reward is delayed, the more its value decreases within the human mind. This is backed up by scans of the human brain, which reveal that immediate rewards trigger higher levels of cognitive activity. At Extole, our internal data reveals that advocates are a whopping 300% more likely to share when prompted to do so on the same page, compared to a dedicated landing page. Instant gratification has become the norm in an age of dwindling attention spans. The excitement and dopamine rush referred friends get from seeing their rewards dissipates over time. You’ve only got a short window to turn a friend share into a converted customer—don’t let it get away. When you design your referral program, do it from a perspective of maximum instant gratification. 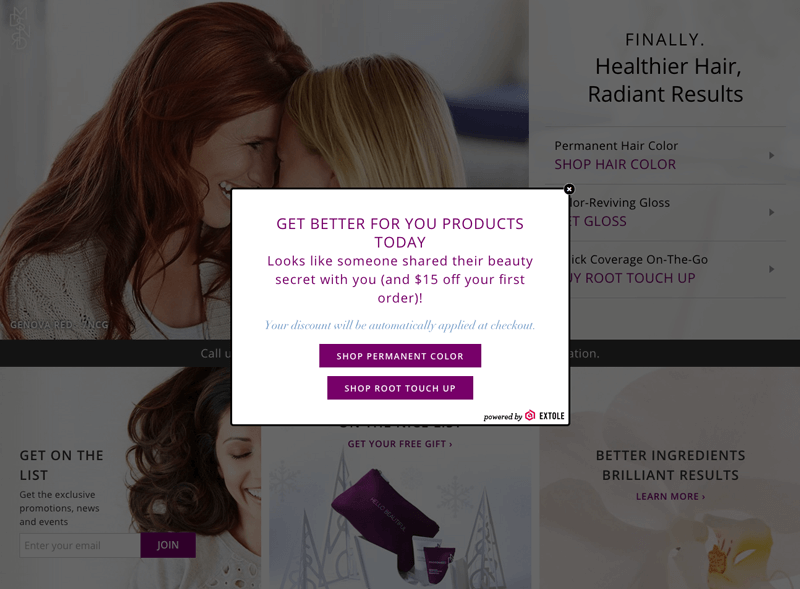 Madison Reed, an e-commerce retailer who sells hair color and care products, does this wonderfully with its Refer-a-Friend program—and it looks great to boot. The referral link takes referred friends straight to the specific promotion on offer—$15 off! The lightbox popup clearly communicates the reward, and two call-two-actions that lead them to specific products. Meanwhile, their $15 credit is automatically applied to checkout. All they have to do is click add to cart, and they’re on their way. A poorly designed referral program presents you with a long coupon code. It either drops you off at the homepage and forces you to hunt for the referral offer, or onto a generic referral landing page where you have to find your own way to the product, to cash in on the deal. You don’t want potential customers flipping back and forth between tabs trying to copy and paste a code—it’s just an extra hoop customers have to jump through. If they’re shopping on their phones, they’ll probably give up altogether. Take a page from Madison Reed’s book, and make the referral process as seamless and gratifying as possible. The “15 dollars off your first order” seems like it’s already in your pocket—and taking it to the checkout is just a couple of clicks away. Let’s say you’ve bought a shiny new pair of sneakers—you’re happy with them, and eager to show them off. But then you start to wonder. What if sneakerhead Steve in the office next door already has a pair? What if you could have bought them cheaper elsewhere? This extreme case of cognitive dissonance holds a valuable lesson for your referral program. The most likely moment of advocacy comes after the moment of purchase—when your customers experience buyer’s remorse and try to reassure themselves that the decision they just made is the right one. At Extole, we’ve seen that a small Refer-a-Friend pop-up after a purchase can massively drive conversions by 16x. While 83% of customers are willing to refer after a positive experience, only 29% actually do. By giving customers the opportunity to share immediately after a purchase, you tap into the excitement of why they did so in the first place. You cut away at buyer’s remorse, and build a positive feedback loop that strengthens brand loyalty, and nets you new customers, too. Zulily does a fantastic job of this. After a customer checks out, they receive an email that thanks them, and invites them to spread the word. Zulily is targeted at moms, so the picture of a cute kid unwrapping her presents bolsters the excitement that customers have for their purchase. Notice that this works so well because it emphasizes the celebratory nature of a customer making a purchase—to the point where the actual referral incentive for a $15 credit is listed in small print at the bottom. 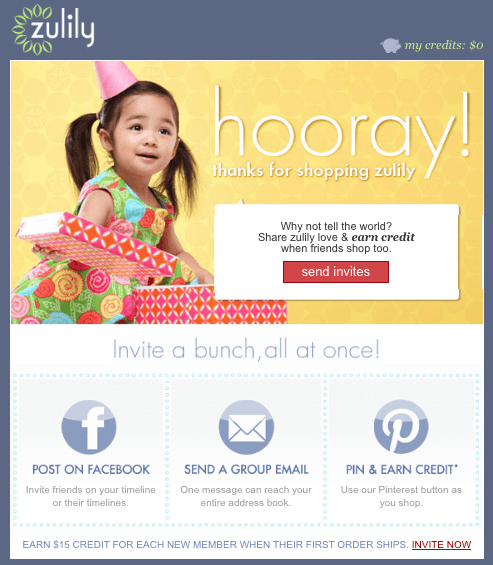 Instead of dwelling on the past, and all the reasons a customer might have to regret their purchase, Zulily gets its customers looking forwards, kicking the referral engine into gear. It’s the principle of social proof—the backbone of referral programs, and what makes them so effective. When people are uncertain about what they should purchase, or if they should purchase at all, they look overwhelmingly to others to help guide decision-making. We’re much more likely to act on a recommendation from a friend than from a giant billboard. A Nielson study shows that 84% consumers trust word-of-mouth recommendations, outstripping any other marketing channel. The problem with many traditional loyalty and referral programs is that they’re purely transactional in nature. They’re more about rewards to-be-gained than about brand loyalty. The referrals that come out of these programs lose human touch, and basically turn into generic advertising. Instead, in order to ramp up your referral program, harness the power of social proof by tapping into organic word-of-mouth. Our internal research shows that simply showing a referred friend who referred them in the first place can increase conversion by 3%, by providing just that one extra layer of social proof. By getting advocates to craft personalized referral messages, you take conversion even farther. 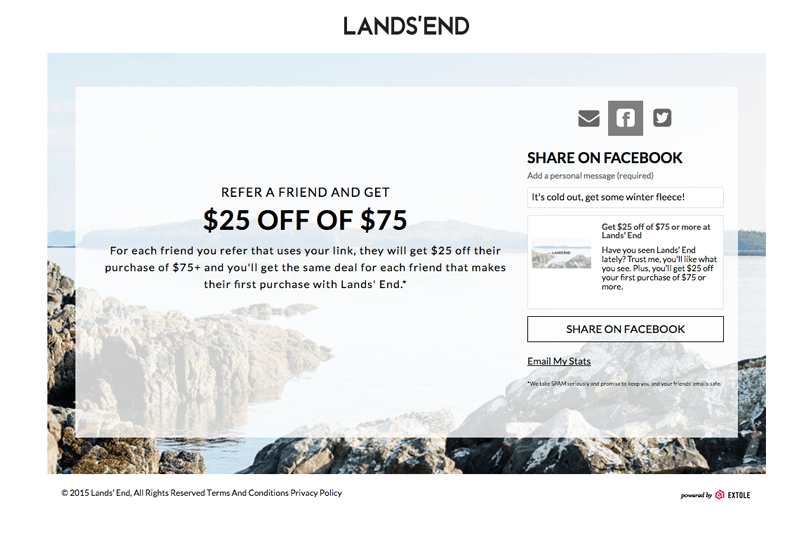 Lands’ End’s referral program, for example, requires advocates to add a personal message in order to share on Facebook. At a glance, this approach seems counterintuitive. Requiring a personal message adds another roadblock to getting your customers happily referring. Why bother? If you see a post on Facebook without a message, you’re liable to think it’s just more advertising. Ad-blindness will kick in, and your eyes will glaze over—it’s just more spam to ignore. Without a message, it looks like these referrers don’t really care about the brand, but are in it for a quick buck. The personalized message is word of mouth. People want to hear a recommendation come out of someone’s voice, and they can tell the difference between what a brand would say, and what their friends would say. When you see that someone’s taken the time to write a personalized referral message, you know that they mean it. That ramps up the power of social proof, and compels you to take a closer look at the offer. One Cornell University professor put the principle of reciprocity to the test. Participants rated paintings with a partner—a research assistant in disguise named Joe. During the experiment, Joe left the room, and returned with a bottle of coke. The real experiment occurred at the end, when Joe took participants aside to sell them raffle tickets—and it turned out that those gifted with a free soda bought double the amount of tickets. Similarly, social psychologist Davis Strohmetz found that waiters could increase tips by 23%, simply by leaving a couple of mints on the bill. This is the principle of reciprocity in play, which states that when someone does us a favor, we feel obligated to return the favor. Referral programs are based around the principle of reciprocity. You provide an incentive, and customers share your brand with their friends. But by taking the rule of reciprocity to the next level, you move away from the transactional nature of Refer-a-Friend programs, and build lasting loyalty. 20% of customers drive 80% of the participation in your referral program—your top-advocates are the real engine behind your referral program. Use the rule of reciprocity to reward them even more, and keep them converting new customers. Never underestimate the power of a simple thank-you. 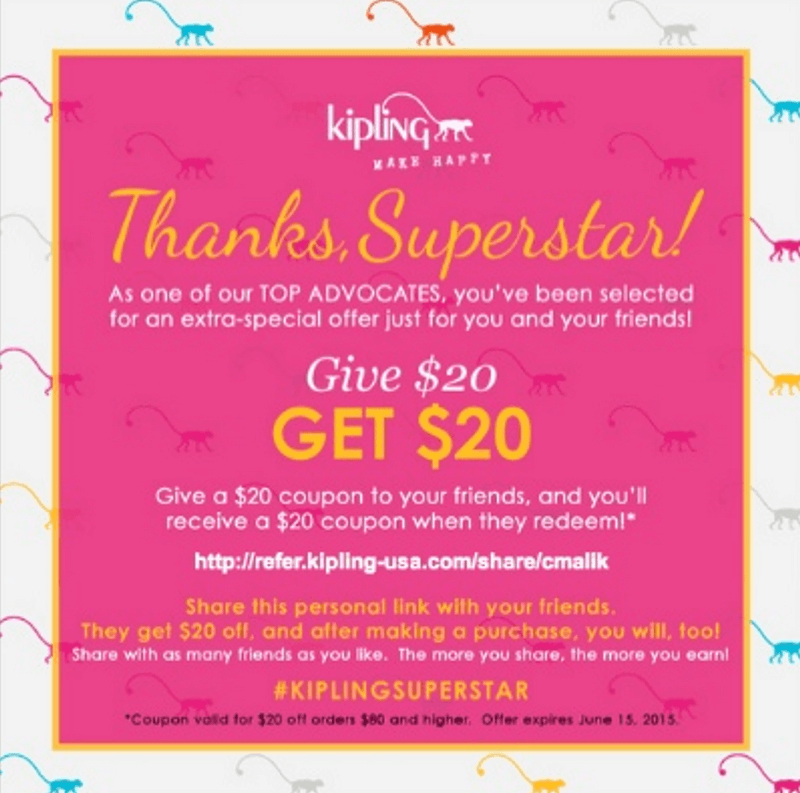 This email from Kipling shows gratitude to top advocates for their performance and loyalty. We all like feeling special, particularly when we’ve done something that deserves the recognition. By acknowledging the “Superstar” quality of these advocates, the email singles them out and recognizes their hard work. These superstar advocates are treated to a special offer, a higher-value version of the reward that other advocates receive. Where a run-of-the-mill advocate might receive a give-$10-to-get-$10 deal, Kipling rewards superadvocates by doubling the incentive on both sides. Kipling is smart not to leave advocates slaving away in the dark. By giving customers a gift, Kipling incentivizes them to reciprocate, and keep referring. The commitment principle states that once we make a commitment, choice, or decision, we feel a basic human instinct to follow through on them. On a psychological level, we feel good when we remain consistent with ourselves, and we find it hard to trust people who change their minds often. Princeton researchers studied the consistency principle by asking people if they’d be hypothetically willing to volunteer for the American Cancer Society. A couple days later, these people were actually called by the American Cancer Society and asked to volunteer. Affirmative response rates clocked in 7x higher than normal. Once someone makes a commitment, they feel compelled to live up to them later. In the experiment, most people were willing to volunteer, and getting a hypothetical commitment was all it took to nudge desire into action. The commitment principle helps us simplify decision-making. When we’ve already committed to something, we don’t have to waste time wondering whether or not to actually do it. The same principle applies to your referral program. Most of your existing advocates are probably in theory willing to refer their friends to your brand—they already have, at least once. Often all it takes is a gentle push to turn referral into a habit. Ever wonder what it is about progress bars that make you just want to fill them up? It’s the commitment principle in action. Bing’s combined loyalty and Refer-a-Friend program puts the commitment principle into action. It allows users to set goals for themselves by choosing their own rewards. In this case, fulfillment of the goal nets the customer a $5 dollar Amazon Gift Card. 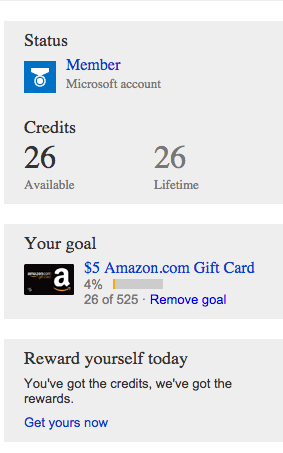 The progress bar toward this reward rests in the user’s dashboard, reminding them of the commitment they already made. Notice the language around Bing’s program—it states “Your goal,” while allowing users the option to remove that goal. This reinforces the strength of the commitment, by emphasizing the user’s agency in setting the goal—and ability to change it. Because users made the choice themselves, they’re all the more likely to actually follow through. It’s easy to ignore a marketing message—the average urban dweller sees 5,000 of them a day. Our inboxes are swarmed with them, we see them constantly on billboards, cereal boxes, and on the television. We close our eyes to them before we go to sleep, and open our eyes to them in the morning, and possibly even dream of them in between. But our ears perk up when a friend shares something—and that’s the magic of referral. It’s not enough to just auto-generate a share link for customers on some dusty corner of your website, and expect a wave of referred customers to start pouring in. In order to truly harness referral, and maximize your marketing budget, you have to design your referral program to tap into the psychology of the consumer. In other words, you have to get at the human behind the computer screen. In doing so, you’ll begin to bridge the gap between the virality of organic word of mouth, and the sustainability of an actively monitored, tracked, and optimized referral program. Create a sustainable ecosystem of virality, and you’ll open up the floodgates to new customers, revenue, and true growth.